Barack Obama is well-known for his gum-chewing habit. At times, this lands him on the wrong side of tact-conscious citizens in the countries he visits, as in India, where Obama was spotted working his jaws at the R-Day parade. 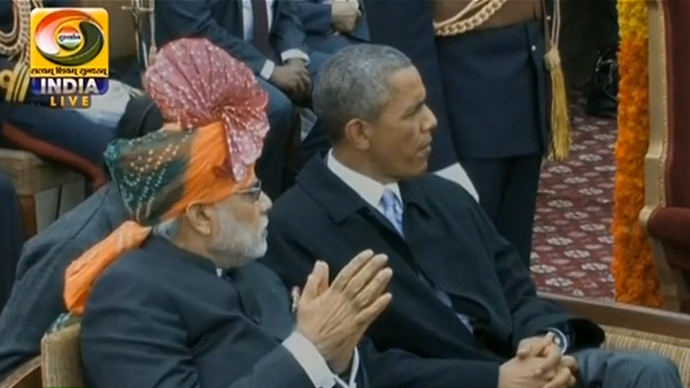 The Republic Day parade was a key moment in Obama’s visit to India. As the American leader was watching military hardware – ironically, much of it sold to India by Russia – passing by, he was chewing bubble gum. Cameras spotted him removing the gum after Indian Prime Minister Narendra Modi said something to him, the Times of India reported. Obama’s not-so-formal occupation at the solemn event provoked criticism from some Indians. Barack bhai working his jaws overtime and chewing gum! At least it isn't gutka. But seriously - gum during a formal parade? Gutka is a kind of chewing tobacco popular in India. Others found the habit somewhat cute. Indians’ reaction is a far cry from how Chinese internet users reacted to Obama’s gum-chewing habits during last year’s APEC summit in Beijing. Obama’s gum chewing apparently stems from his long-time battle to quit smoking. Nicorette gum helped him ease the pressure to have a cig, according to a Washington Post investigation. The president’s actions in formal situations are scrutinized by his Republican critics, who pick up on the slightest faux pas. At various times he has been blasted for calling Nazi Germany’s death camps in Poland “Polish” during a visit, giving military guards a “latte salute”, and even not looking tough enough during a gym workout session.